I saw that you made playing-programs not only for Go, but also for Chess, Othello and some other board games. What is your favorite game? From a programmer’s point of view, Go is much more exciting. The Monte-Carlo approach is a gold mine in terms of new ideas and algorithms. Chess programs continue to progress, but there have been no major changes in their algorithms for a long time. The Monte-Carlo tree search, on the other hand, is a completely new approach and major discoveries remain to be done. Go-playing programs are making progress extremely fast, so it is a much more exciting field for researchers. From a player’s point of view, I also like Go better, but almost never play. I played a little in the beginning, to understand the game, but don’t any more. I just watch the games of Crazy Stone. Chess programs are very good at openings, but we can see some really weird moves played by Go programs in the fuseki stages. As well as I know, Go programs don’t use fuseki/joseki databases. How do you explain this? Well, Chess programs are much stronger than the best humans, whereas Go programs are much weaker. Go programs do use fuseki/joseki databases, Crazy Stone would not play a human-like fuseki without them. It automatically learns good and bad shapes by analyzing a large database of games played by strong humans. It is not possible to play strong Go without knowledge of basic shape. All reasonably strong Go programs use that kind of database. Maybe when Go programs reach the level of professionals, they will be able to invent new fuseki and joseki. On a 9×9 board the role of fuseki is much more important. I think it’s possible to find at least 500 games played by top pros and decide the best strategy for Black and for White on a 9×9 board. Did you work from this perspective? I almost never work on 9×9 boards. I know that the Mogo team spent considerable amount of effort in building a big opening book. They hired professional players and recorded lots of games. Apparently, they still lose from time to time, so finding the optimal strategy on a 9×9 board is not so easy. Many people think that tengen (central point) is the only move for Black to begin with on a 9×9 board. Do you agree? My program prefers to play there. So does Mogo after many years of opening-book building, but I can’t be certain. 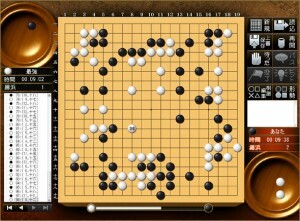 Many Go programs like to play Cosmic Go like Takemiya sensei and it creates a big difference in the styles between top computers and top humans. Why do you think this is? I don’t know. I have noticed that as my program makes progress, it tries to make territory in the center less frequently. It is difficult to explain. Maybe random play outs of the MC algorithms find it difficult to estimate the opponent’s ability to invade. For a long time in Shogi it was forbidden for Japanese pros to challenge computers in public. Should we accept the same rule in Go so the top players can save face? I know that computers are still much weaker, but they are improving quickly. This is a decision for human players to make, not programmers. I believe that kind of rule would be more difficult to apply to Go than to Shogi, because there is no central Go authority. I personally like computer vs. computer competition much more than computer vs. human anyway. Playing against humans in informal games on KGS is fun and very interesting. But the real sport for me is computer vs. computer. Yes, checkers has been solved completely. I feel there is no chance that this will happen soon in Go. The largest square board that is solved formally is 5×5. On a 7×7 board, programs may play close to perfectly, but there is no formal proof of it. On 9×9, we are not yet completely sure what the right komi is. Kajiwara-sensei was famous for discussing early mistakes in fuseki (for example, White 2 – the losing move). Do you think it is possible, with the help of top computers to prove his statements? Can we decide which corner stone is the best one? Hoshi, komoku, san-san… maybe something more extravagant like 5-3 or 5-4? I don’t expect computers will ever be able to decide this kind of question. If they can, it will be in a very long time. Kajiwara-sensei might have been being a little facetious, in my humble opinion. I heard that mane-Go (mirror Go) is very effective against computers. Has anyone tried it against Crazy Stone? I have not noticed anybody trying it. I heard it said that computers are weak at ko fights. Do you agree? They might not be so good at ko fights, but semeai is their main weakness. It is the area where I am focusing most of my efforts now. Crazy Stone sometimes makes 10k blunders because of semeai. In the late (1-2 points) yose stages, computers play a lot inside their own territory if they are leading. Sometimes these defensive moves are very strange. How do they choose which points to defend? Most Monte-Carlo programs try to maximize their probability of winning. They don’t really care whether they win by more than 0.5 point and often prefer to reinforce their territory. When almost every move leads to a sure win, they tend to play random moves that may look very strange to humans. When many moves have a 100% winning rate, the deciding factor is good shape, but that may still lead to nonsense moves. For the commercial release of Crazy Stone, I tried to make it a little more territory-greedy in the final stages so that it is less confusing and maybe a little more natural to humans. But it still plays weird moves in the endgame from time to time. Is it true that Crazy Stone also thinks and read variations, while it’s the opponent’s turn? Yes. Most programs do it. If the move of the opponent is correctly predicted, it will saves thinking time for the next move. How many moves ahead does Crazy Stone read in the fuseki? This is difficult to answer. The principle of Monte-Carlo algorithms consists in playing the game out, so in a way Crazy Stone reads ahead all the way to the end of the game. It does build a search tree, but its search depth is very uneven. A search may become very deep if there is a sequence of forced moves, or very shallow if many moves are reasonable candidates. In the beginning of the game, I would estimate that it does not search more than 3-4 moves ahead. When do you think computers will reach pro level? That’s difficult to predict. Maybe in 10 to 20 years. How strong is your Chess program, and do you still work on improving it? Do you have plans to fight with top Chess programs like Rybka? My Chess program is very weak compared to the top programs (A.D: according to chess programs rating, Crazy Bishop by Remi Coulom has about 2450 ELO, but it was created long time ago and that time it was one of strongest chess engines), but it is more than strong enough for human players. I don’t work on making it stronger any more. In fact, for the release of the iPhone version, I had to make it weaker since the full-strength program is way too strong for most customers. Will we see such cases in computer Go? I don’t have anything to add to the report of the ICGA. It is clear that Rybka did not follow the originality rules of the WCCC, and it was disqualified. I am sure it will happen again in the future. Currently, there is no open-source Go program that is close in strength to the top programs, so the situation is rather healthy. But that probably won’t last forever. Where can we buy Crazy Stone? Is it possible to subscribe for future updates as well? Subscription for future updates is more or less automatic on the App Store. I am not aware of a subscription scheme for the PC version. Could bonobot play on DGS so that it can be tested with longer time limits? What rank would bonobot be if it played:1. with normal time control 2. in slow games against humans? @Robert & @zyzzyva: I am not aware of a tool for conveniently connecting a GTP engine to DGS. But I could play with longer time limits on KGS. Crazy Stone gets stronger with more thinking time, but so do humans and I expect that humans would perform better relatively with slower time settings. This phenomenon has already been observed with Zen, I expect it will be the same for Crazy Stone. Am I right, that Crazy Stone is a self-learning program? If yes, can it reach 6-7 dan level purely by playing a few thousand games? @Erin: Crazy Stone learns from a database of good and bad shapes offline, by analyzing games of strong players, but it does not make progress while it plays on the server. Is it possible for Crazy Stone to create new fuseki, or is its learning dependent upon the patterns played by its opponents? 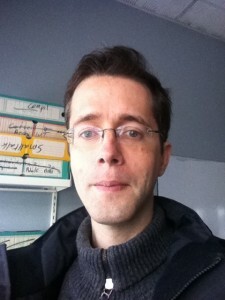 @cbc: It is possible to create new fuseki, but I am not sure how good they would be. In the past, MC programs used to be more creative than they are now. I particularly like this photo: http://yssaya.web.fc2.com/photo/uec2008/1214/Htmls/IMG_6987.html This was the final of the second UEC Cup, in 2008. Crazy Stone was White, and won. Commentator was Kaori Aoba (4p). When Guo Juan commented the final of the 2007 Computer Olympiad, she said the program is very romantic Nowadays, Crazy Stone imitates normal human moves, which makes it play stronger. Besides Crazy Stone, you are the author of BayesElo, a very useful tool for all computer chess enthusiasts and engine authors (including me). What do you think about the great unification of rating systems around the world? Currently we have a lot of national systems plus a lot of server systems with non-obvious conversion rules. 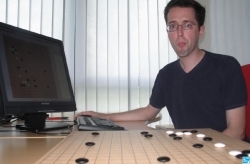 Could you write something like BayesElo for Go, taking proper handicap principle into account? Adjusting the model to take handicap into consideration would not be very difficult. The main difficulty with uniting rating system is not about the algorithm anyway. It is more about politics. Do you have any plans to participate in on-board tournaments against amateurs, like Deep Thought and other strong chess programs did in the end of 1980s? At the European Go Congress, maybe, not in exhibition games, but in the main event? I don’t like playing competitions against humans. As a human player, I would hate to play a computer in a tournament. I don’t believe it would be a good idea to allow it in normal tournaments. Exhibition games are ok, but I don’t like participating in them either. I know there will be a computer event in Bordeaux this year, but I don’t plan to attend.